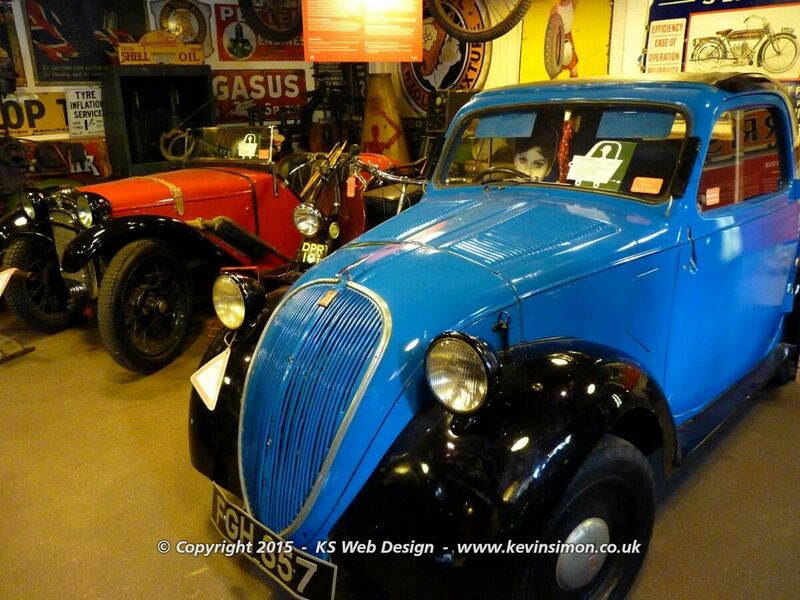 While on a nice day out in Bourton on the water we visited a few attractions one of these was the Cotswold motoring museum and toy collection, price are £5.25 Adults, £3.74 Children (4-16yrs) under 4’s free family ticket 2 adults 2 children is £16.50. For the latest prices and opening times see their website HERE. On display there are 56 vehicles including 37 cars, 16 motorbikes and 3 caravans separated into 7 different sections these are: Mill Gallery, Blacksmiths Workshop, Windrush Alley, Jack Lakes Garage, Paved Paradise, Dream a Little Dream and the Toy Collection. Each section has a different feel as from a different era of time, like Jack Lakes Garage, this is set out like the garage that was owned by Jack within the village of bourton ton on the water, if you pick up the telephone you here jack telling you about the garage, and this really does take you back in timer and seems like you are really there. The mill Gallery is the home to the kids TV show BRUM based around the half-scale replica of a late-1920s Austin 7 “Chummy” convertible, now I had to have my photo taken with brum, its not that often im in front of the camera, but had to have a photo of me taken with brum, as remember watching this when my daughter was young. In the 1960’s section “dream a little dream” it is a very psychedelic room, though the figures they have in Morris Minor convertible have plain white faces and to be honest looks like something out of a horror movie 🙂 The toy collection is a great area and does have many toys that anyone will remember from their childhood. Each room has so much around the room from enamel advertising signs on the walls (which there are over 800) to aeroplanes hanging from the ceiling, so if you do visit look all around as there is a lot to take in. Myself I did really enjoy looking around the museum, I did enjoy looking at the old toy cars this took me back to my childhood and just in general looking around, though the missus and the teenage daughter wasn’t really that interested in it, but was worth a look around especially if your are into your vintage transport and looking at retro toys, then you will enjoy it, and for just over £15 for a family of four is a reasonable price for at least an hour if you look round quickly.